Getting adjusted to a new routine can be hard. I’m loving living in San Francisco, but it’s been a bit difficult to settle in and organize my day. In particular, I haven’t quite figured out what type of exercise routine works best for my schedule yet. I’ve been trying to fit in a run or strength workout after work, but I’m often so, so tired that I just want to enjoy dinner and then collapse in bed. Yesterday, I decided to try a quick workout before leaving home for the day. I completed a T25 lower body workout video. I love that this series fits an intense routine into 25 minutes. I woke up at the same time I always do, and made it to the office only 15 minutes later than normal. I’ll keep you updated about whether the morning workout remains a part of my everyday routine. 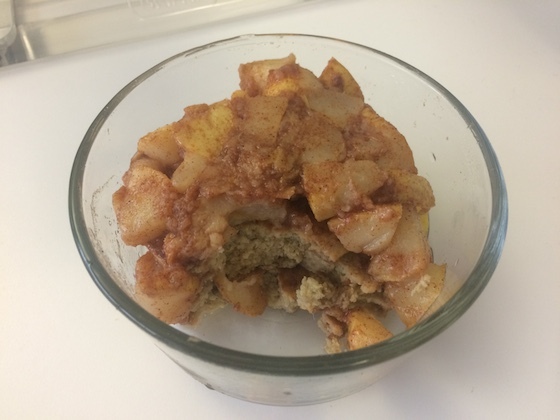 After arriving at work, I enjoyed some protein pancakes topped with a pear that I cooked with a little cinnamon. 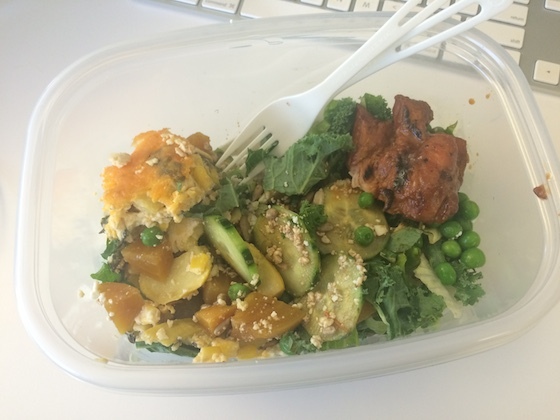 For lunch, I enjoyed a large green salad topped cucumbers, beets, and feta, plus a piece of chicken and a little vegetable casserole. 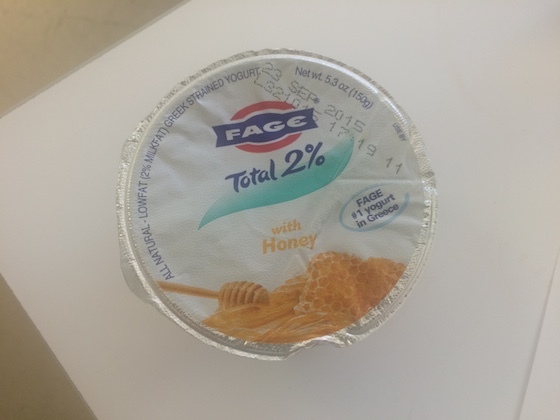 I also snacked on some Greek yogurt with honey stirred in. After work, I met up with some girlfriends at a Vietnamese restaurant. 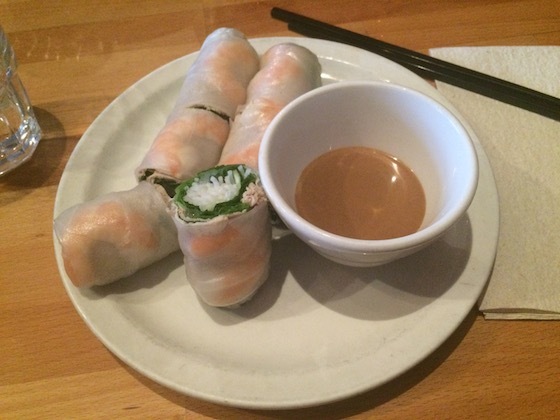 I wasn’t too hungry, so I enjoyed an order of spring rolls while we chatted. It was fun to catch up with one of my best friends, and to get to know the other two girls a bit better! Once I got home, I did laundry and tidied up a bit because a friend is visiting for the weekend. 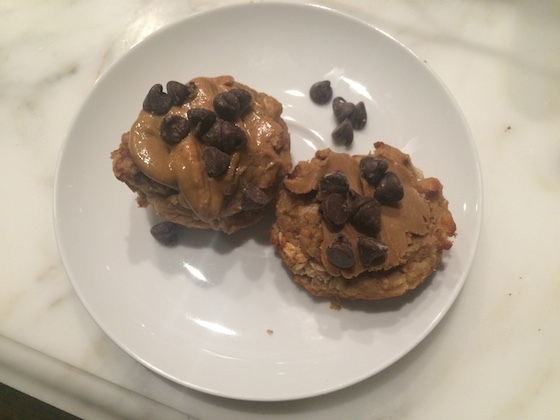 I finished off the night with two banana peanut butter oat muffins topped with some more peanut butter and a few chocolate chips. Have a great weekend, and I’ll catch up with ya on Monday!